LINDSAY– Marlena Gutierrez’s journey as a thrower in track and field began three months ago. Her strong legs and jumping ability led Cardinals’ throwing coach John Caesar to believe she could be an instante success. There were a couple obstacles however. She was more use to throwing a softball and was remaining loyal to that sport. Finally, after many requests by Coach Caesar, she decided to give it a try. Her first throw landed at a distance of over thirty feet. Already a three-sport athlete, and with prior knowledge of how hard it was to win league, Gutierrez was skeptical of the coach’s reaction. Still, she was hooked and decided to keep on going. As Gutierrez continued to progress throughout the season her nor John could have guessed what doors would be open. After she won the East Sequoia League Championships in the shot put and discus hopes of walking on to the track team at UC Davis where she had already enrolled began to take shape. 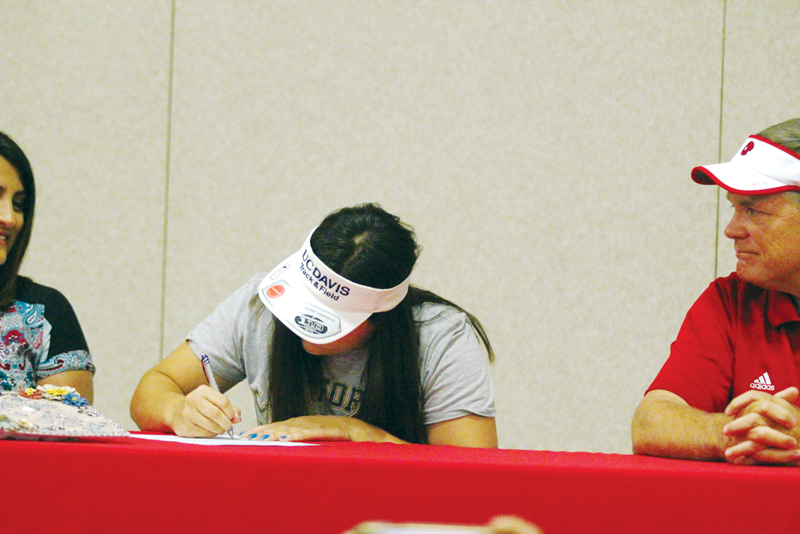 Now several months later her hope has become a reality as she signed her letter of intent ensuring her spot to compete for the Aggies. “This is something I can’t believe is happening right now because it feels like a dream,” Gutierrez said. Gutierrez’s shot put abilities began to blossom during the second half of the season. She was constantly throwing in the mid-thirties range. In the last four meets of the season it began to look as if she could break the forty-foot mark. At both the ESL and the D-II championships she knocked on the door, but came up short with throws of 38 feet, ½ inch, and 37 feet, 8 inches, respectively. On May 19 at the CIF Central Section Masters Meet in Clovis, Gutierrez got another chance. Only this time if she did not break the 40-foot mark her season would be over. Waiting for her turn to throw Gutierrez made a new friend in Jocelynn Budwig, who went on to become this year’s state champion in the shot put. Budwig had some last minute encouragement for Gutierrez. “She told me, ‘I was one of them now and to just go out there and throw with confidence’,” Gutierrez said. The encouragement must have worked because Gutierrez broke the mark throwing 42 feet, ¾ inch, placing her fourth overall in the event. It not only gave her an automatic qualifying spot in the state championships, but it was the throw which put her on UC Davis’ recruitment radar. Gutierrez’s high school career ended in Clovis with a top 25 finish in the CIF State Championship Prelims on June 1. She threw a distance of 37 feet, 4¾ inches. A couple of days later, UC Davis made the official offer to her.